Her eccentric boss has spent his whole life searching for the resting place of the lost Ninth Roman Legion and is convinced he’s finally found it—not because of any scientific evidence, but because a local boy has “seen” a Roman soldier walking in the fields, a ghostly sentinel who guards the bodies of his long—dead comrades. 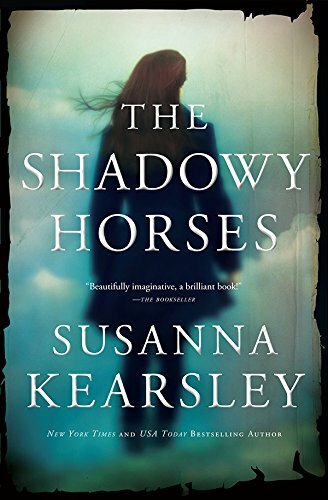 Don’t miss the next enchanting novel from Susanna Kearsley, Bellewether, coming August 2018! I absolutely love Susanna’s books; her characters are easy to like, the story is interesting and the plot always has some kind of twist. The Shadowy Horses is no exception to the rule. The story pulled me in right from the beginning. There was enough interest to make me want to keep reading and the romantic portion, even though very mild, was enough to keep my imagination working. One of the things I like about Susanna’s writing is how she explains what she needs but lets the rest up to the readers imagination. Take for instance the tension leading up to the romantic scene; but not really a romantic scene. There wasn’t detail or anything but left me wondering and allowed my imagination to fill in the blanks. This story is a bit different from most of her other books since there isn’t an actual time travel episode. Instead, there are flashbacks in a way (I don’t want to give too much away). The end of the story is always a bit of a disappointment for me. I’m not disappointed with the story line but I always feel like I’m saying ‘good-bye’ to some good friends; and again, there is always story left over so the reader can fill in the blanks. I’m anxiously waiting for the next book from Susanna and have to admit I haven’t been reading her books in succession. The first book I read was Winter Sea and have enjoyed all of the books since. Keep up the fantastic writing! This is my favorite Susanna Kearsley novel so far. I have only read The Winter Sea and The Rose Garden and I really liked both of them but this is my favorite to date. All three novels have a bit of a otherworldly or paranormal slant to them, The Winter Sea and The Rose Garden are a little far fetched but it doesn’t detract from the enjoyment of those stories. The Shadowy Horses has ghosts and psychics which is still far fetched (depending on your beliefs) but more believable. I wouldn’t say this is an out right romance, it has more substance than that (again not knocking romance novels, I love them too) but it is a mystery with romantic overtures. The romance isn’t just between the main characters (Verity and David) but one’s passion for their profession, family, town, history and much more. I fell in love with all the characters and the little town in Scotland. I learned a little bit about the Roman occupation of Britain. The only thing that confused me a little about this novel was it seemed to have been written in the late 90’s or early 2000’s. No one seemed to have cell phones, they did a lot of work cataloging by hand not computer. I really enjoyed this book. Kearsley always does such a great job introducing historical periods into her contemporary books. I can’t wait to read another of her books. This is the first book I have read by Ms. Kearsley, but not the last. Good story, great research, totally believable characters. Highly recommended!